If you read data science articles, you may have already stumbled upon FiveThirtyEight’s content. Naturally, you were impressed by their awesome visualizations. You wanted to make your own awesome visualizations and so asked Quora and Reddit how to do it. You received some answers, but they were rather vague. You still can’t get the graphs done yourself. In this post, we’ll help you. Using Python’s matplotlib and pandas, we’ll see that it’s rather easy to replicate the core parts of any FiveThirtyEight (FTE) visualization. To follow along, you’ll need at least some basic knowledge of Python. If you know what’s the difference between methods and attributes, then you’re good to go. 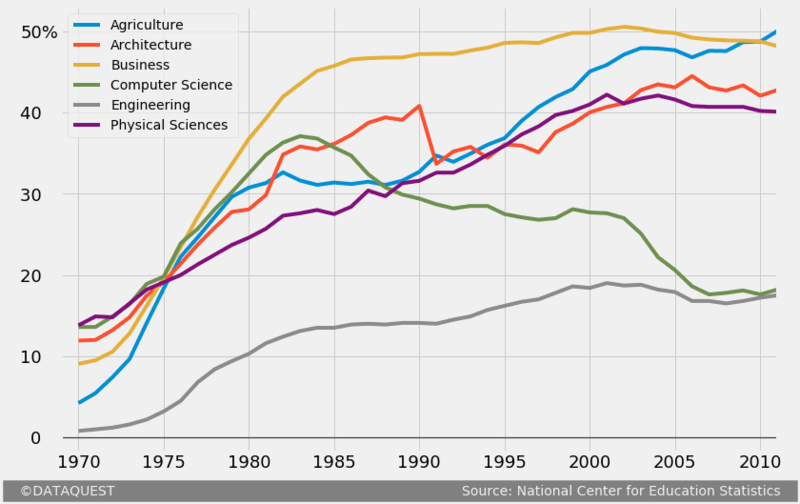 We’ll work with data describing the percentages of Bachelors conferred to women in the US from 1970 to 2011. We’ll use a dataset compiled by data scientist Randal Olson, who collected the data from the National Center for Education Statistics. Assign the direct link toward the dataset as a string to a variable named direct_link. Read in the data by using read_csv(), and assign the content to women_majors. Print information about the dataset by using the info() method. We’re looking for the number of rows and columns, and checking for null values at the same time. Show the first five rows to understand better the structure of the dataset by using the head() method. Besides the Year column, every other column name indicates the subject of a Bachelor degree. Every datapoint in the Bachelor columns represents the percentage of Bachelor degrees conferred to women. Thus, every row describes the percentage for various Bachelors conferred to women in a given year. Almost every FTE graph is part of an article. The graphs complement the text by illustrating a little story, or an interesting idea. We’ll need to be mindful of this while replicating our FTE graph. To avoid digressing from our main task in this tutorial, let’s just pretend we’ve already written most of an article about the evolution of gender disparity in US education. 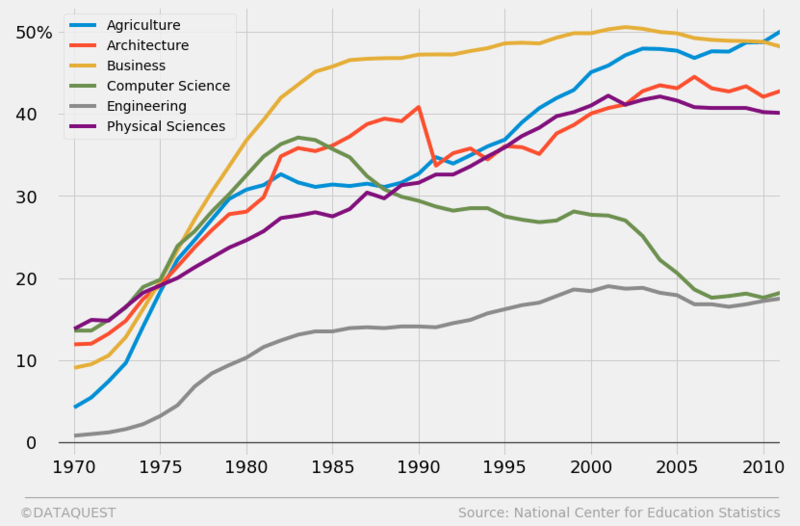 We now need to create a graph to help readers visualize the evolution of gender disparity for Bachelors where the situation was really bad for women in 1970. We’ve already set a threshold of 20%, and now we want to graph the evolution for every Bachelor where the percentage of women graduates was less than 20% in 1970.
select the items in the first row only where the values are less than 20; the Year field will be checked as well, but will obviously not be included because 1970 is much greater than 20. Assign the resulting content to under_20. Run the Jupyter magic %matplotlib to enable Jupyter and matplotlib work together effectively, and add inline to have our graphs displayed inside the notebook. figsize – sets the size of the figure as a tuple with the format (width, height) in inches. Assign the plot object to a variable named under_20_graph, and print its type to show that pandas uses matplotlib objects under the hood. The graph above has certain characteristics, like the width and color of the spines, the font size of the y-axis label, the absence of a grid, etc. All of these characteristics make up matplotlib’s default style. As a short parenthesis, it’s worth mentioning that we’ll use a few technical terms about the parts of a graph throughout this post. If you feel lost at any point, you can refer to the legend below. 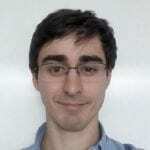 Import the matplotlib.style module under the name style. Explore the content of matplotlib.style.available (a predefined variable of this module), which contains a list of all the available in-built styles. You might have already observed that there’s a built-in style called fivethirtyeight. Let’s use this style, and see where that leads. For that, we’ll use the aptly named use() function from the same matplotlib.style module (which we imported under the name style). Then we’ll generate our graph using the same code as earlier. Wow, that’s a major change! With respect to our first graph, we can see that this one has a different background color, it has grid lines, there are no spines whatsoever, the weight and the font size of the major tick labels are different, etc. You can read a technical description of the fivethirtyeight style here – it should also give you a good idea about what code runs under the hood when we use this style. The author of the style sheet, Cameron David-Pilon, discusses some of the characteristics here. All in all, using the fivethirtyeight style clearly brings us much closer to our goal. Nonetheless, there’s still a lot left to do. Let’s examine a simple FTE graph, and see what else we need to add to our graph. Add a title and a subtitle. Remove the block-style legend, and add labels near the relevant plot lines. We’ll also have to make the grid lines transparent around these labels. Add a signature bottom bar which mentions the author of the graph and the source of the data. increase the lateral margins of the figure. To minimize the time spent with generating the graph, it’s important to avoid beginning adding the title, the subtitle, or any other text snippet. In matplotlib, a text snippet is positioned by specifying the x and y coordinates, as we’ll see in some of the sections below. To replicate in detail the FTE graph above, notice that we’ll have to align vertically the tick labels of the y-axis with the title and the subtitle. We want to avoid a situation where we have the vertical alignment we want, lost it by increasing the font size of the tick labels, and then have to change the position of the title and subtitle again. For teaching purposes, we’re now going to proceed incrementally with adjusting our FTE graph. Consequently, our code will span over multiple code cells. In practice, however, no more than one code cell will be required. Plot the graph using the same code as earlier, and assign the resulting object to fte_graph. Assigning to a variable allows us to repeatedly and easily apply methods on the object, or access its attributes. labelsize – sets the font size of the tick labels. You may have noticed that we didn’t use style.use('fivethirtyeight') this time. That’s because the preference for any matplotlib style becomes global once it’s first declared in our code. We’ve set the style earlier as fivethirtyeight, and from there on all subsequent graphs inherit this style. If for some reason you want to return to the default state, just run style.use('default'). We add a “%” symbol to 50, the highest visible tick label of the y-axis. We also add a few whitespace characters after the other visible labels to align them elegantly with the new “50%” label. To make these changes to the tick labels of the y-axis, we’ll use the set_yticklabels() method along with the label parameter. As you can deduce from the code below, this parameter can take in a list of mixed data types, and doesn’t require any fixed number of labels to be passed in. alpha – regulates the transparency of the line, but we use it here to regulate the intensity of the black color; the values for alpha range from 0 (completely transparent) to 1 (completely opaque). As we mentioned earlier, we have to add another vertical grid line in the immediate vicinity of the tick labels of the y-axis. For that, we simply tweak the range of the values of the x-axis. Increasing the range’s left limit will result in the extra vertical grid line we want. Below, we use the set_xlim() method with the self-explanatory parameters left and right. It’s positioned at the bottom of the graph. The author’s name is located on the left side of the signature bar. The source of the data is mentioned on the right side of the signature bar. The text has a light grey color (the same as the background color of the graph), and a dark grey background. The area in-between the author’s name and the source name has a dark grey background as well. It may seem difficult to add such a signature bar, but with a little ingenuity we can get it done quite easily. We’ll add a single snippet of text, give it a light grey color, and a background color of dark grey. We’ll write both the author’s name and the source in a single text snippet, but we’ll space out these two such that one ends up on the far left side, and the other on the far right. The nice thing is that the whitespace characters will get a dark grey background as well, which will create the effect of a signature bar. We’ll also use some white space characters to align the author’s name and the name of the source, as you’ll be able to see in the next code block. Remove the label of the x-axis by passing in a False value to the set_visible() method we apply to the object fte_graph.xaxis.label. Think of it this way: we access the xaxis attribute of fte_graph, and then we access the label attribute of fte_graph.xaxis. Then we finally apply set_visible() to fte_graph.xaxis.label. backgroundcolor – sets the background color of the text snippet. The x and y coordinates of the text snippet added were found through a process of trial and error. You can pass in floats to the x and y parameters, so you’ll be able to control the position of the text with a high level of precision. It’s also worth mentioning that we tweaked the positioning of the signature bar in such a way that we added some visually refreshing lateral margins (we discussed this adjustment earlier). To increase the left margin, we simply lowered the value of the x-coordinate. To increase the right one, we added more whitespace characters between the author’s name and the source’s name – this pushes the source’s name to the right, which results in adding the desired margin. This kind of signature bar can be replicated quite easily as well. We’ll just add some grey colored text, and a line right above it. We’ll create the visual effect of a line by adding a snippet of text of multiple underscore characters (“_”). You might wonder why we’re not using axhline() to simply draw a horizontal line at the y-coordinate we want. We don’t do that because the new line will drag down the entire grid of the graph, and this won’t create the desired effect. We could also try adding an arrow, and then remove the pointer so we end up with a line. However, the “underscore” solution is much simpler. In the next code block, we implement what we’ve just discussed. The methods and parameters we use here should already be familiar from earlier sections. The title is almost invariably complemented by a subtitle. The title gives a contextual angle to look from at a particular graph. The title is almost never technical, and it usually expresses a single, simple idea. It’s also almost never emotionally-neutral. In the Fandango graph above, we can see a simple, “emotionally-active” title (“Fandango LOVES Movies”), and not a bland “The distribution of various movie rating types”. The subtitle offers technical information about the graph. This information is what makes axis labels redundant oftentimes. We should be careful to customize our subtitle accordingly since we’ve already dropped the x-axis label. Visually, the title and the subtitle have different font weights, and they are left-aligned (unlike most titles, which are centered). Also, they are aligned vertically with the major tick labels of the y-axis, as we showed earlier. Add a title and a subtitle by using the same text() method we used to add text in the signature bar. If you already have some experience with matplotlib, you might wonder why we don’t use the title() and suptitle() methods. This is because these two methods have an awful functionality with regard to moving text with precision. The only new parameter for text() is weight. We use it to bold the title. In case you were wondering, the font used in the original FTE graphs is Decima Mono, a paywalled font. For this reason, we’ll stick with Matplotlib’s default font, which looks pretty similar anyway. Right now, we have that clunky, rectangular legend. We’ll get rid of it, and add colored labels near each plot line. Each line will have a certain color, and a word of an identical color will name the Bachelor which that line corresponds to. We’ll compile a list of RGB parameters for colorblind-friendly colors by using values from the above image. As a side note, we avoid using yellow because text snippets with that color are not easily readable on the graph’s dark grey background color. After compiling this list of RGB parameters, we’ll then pass it to the color parameter of the plot() method we used in our previous code. Note that matplotlib will require the RGB parameters to be within a 0-1 range, so we’ll divide every value by 255, the maximum RGB value. We won’t bother dividing the zeros because 0/255 = 0. Finally, we add colored labels to each plot line by using the text() method used earlier. The only new parameter is rotation, which we use to rotate each label so that it fits elegantly on the graph. We’ll also do a little trick here, and make the grid lines transparent around labels by simply modifying their background color to match that of the graph. In our previous code we only modify the plot() method by setting the legend parameter to False. This will get us rid of the default legend. We also skip redeclaring the colors list since it’s already stored in memory from the previous cell. That’s it, our graph is now ready for publication! 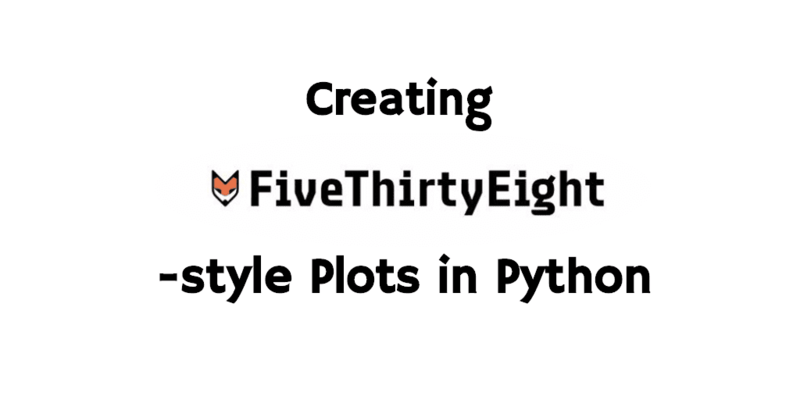 We used matplotlib’s in-built fivethirtyeight style. We added a title and a subtitle, and customized each. We added a signature bar. We removed the default legend, and added colored labels. We made a series of other small adjustments: customizing the tick labels, bolding the horizontal line at y = 0, adding a vertical grid line near the tick labels, removing the label of the x-axis, and increasing the lateral margins of the y-axis. Generate a similar graph for other Bachelors. Generate different kinds of FTE graphs: a histogram, a scatter plot etc.